NOTE: This event is CLOSED. Click below to access the latest training schedule. Please see our next available training session schedule below. Venues will be announced. We are pleased to announce the following ArchiCad training sessions for our Western Cape clients / users to take part in. Please read all the event details and complete the form below once for each session with the number of attendees you wish to make a booking for. We will reply to your email address with the booking invoice and updated venue details to confirm your booking. Join our beginner to intermediate level training course. > Only 8 places: Booking is Essential !!! Complete the form below for your booking request. This training course will take an absolute novice through the initiation phases of familiarity building in ArchiCAD, through learning the tools and working environment, to the correct manipulation and creation of the 3D BIM model building process for architectural representation. The attendees are not required to complete an assessment before participating in the course, but will be required to complete and assessment test after the completion of the course. Training ready Laptops with ArchiCad 16 fully loaded is available on a "first come first serve basis" upon request (see details in T&C below). Join our intermediate to high level training course. This training course is intended for users who have already gained entry level ArchiCAD knowledge and wish to convert that knowledge into a productive working knowledge of correct 3D BIM model building, output display control and multiple user interaction and the associated working disciplines. All attendees are required to complete this assessment test www.graphisoft.com/education/certification , to verify the level of training that is to be undertaken, prior to commencement of the course. The required score for this level of training is 50%. A screenshot of the results should be submitted to the event organizer for verification. Join our high-end user to expert level training course. This course is for the “experts-in-training” out there. To participate you will have to know ArchiCAD well enough to create high quality 3D BIM building models already. In this course you will learn how to work in teams, how to work in multiple project files on your own or in teams; how to setup project templates for single user and multi user teams, including file exchange to other platforms with synchronization and consultant interaction. > Level 4 – (1 Day) Documentation proficiency – High-level training on collaboration and BIM modelling output and more. > Level 5 – (1 Day) Project Setup proficiency – Expert level training on project setup, templates, standards, favorites, navigator, publishing and other project settings. All attendees are required to complete this assessment test www.graphisoft.com/education/certification , to verify the level of training that is to be undertaken, prior to commencement of the course. The required score for this level of training is 66%. A screenshot of the results should be submitted to the event organizer for verification. Please complete the form to the bottom right to Book your seat/s. We will then send you a quotation / proforma invoice with payment details via e-mail for your booking. (Terms & Conditions will apply - see below). tea/coffee at arrival and a mid break. Training material on disk (Videos & PDF-files). Most of the trainings is "workshop" type of training session. Attendees must bring their own computers. We can supply laptops or screens on request (possible fees might apply). All trainees attending training sessions for L3, L4 or L5, must complete the online ArchiCad 15 Practice test on the version they last actively worked on and send us a “screen print” of the summary results page to me at least three days before the course date. The course is presented in a face-2-face format, in a small group, limited to a maximum of eight attendees, to ensure a high level of trainer and attendee interaction and ongoing assessment. Attendees are further provided with a tutorial and documentation set, which is used during and after the training. 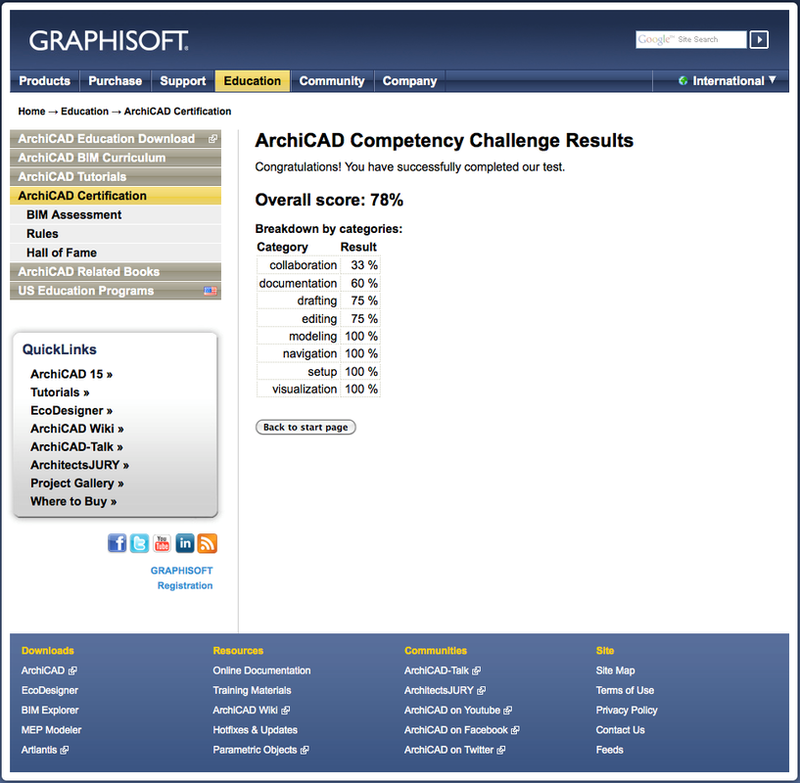 Attendees who successfully complete the training course, are issued with GRAPHISOFT certification in accordance to their performance and training level completed. > Booking is Essential !!! Submitting your booking details in the "ArchiCafd 16 Training - Booking Form" above confirms your acceptance of the "Terms & Conditions" stated here. Clients / ArchiCad users with valid Software Service Agreements will be given a 25% discount from the quoted course fee in compliance with their SSA. Any company / practice that completes a booking for 2 or more attendees per session will get 10% discount on the quoted price. SSA Clients could get up to a total of 35% discount per session if 2 or more attendees are booked per session. All training fees must be fully paid to the account below, to reflect before the first training session starts. Cancellation of bookings must be faxed to 086 515 4965 or e-mailed to info@multicad.co.za not less than 5 days before the course date. All booking canceled by less than 5 days before the course date will carry a non-refundable handling fee of 15%. All invoices will be C.O.D. and an interest of 2% per annum above current prime rate (local currency) at that time will be charged on any overdue amounts. All payments must be made to the bank account stated on the invoice issued by MultiCad Design Solutions for your booking. Training ready Laptops with ArchiCad 16 fully loaded is available on a "first come first serve basis" upon request at no extra cost if the attendee confirms his/her booking & makes effective payment at least 8 days before the training start date. MultiCad Design Solutions reserves the right to cancel the training session without prior notice at their discretion. Although it is not MultiCad Design Solutions's intention to cancel any training session: In the case where MultiCad Design Solutions needs to cancel the training session, your training fee will be refunded 100% within 5 working days of the notice of cancellation and receipt of the attendee's banking details. Seats will be taken up on a "first come first serve basis" for confirmed payments for each booking.